As some of you are aware, when I'm not busy working at the data mines, building an airplane, washing my car, mowing the lawn, or blogging, I write video game reviews for a website called GamingNexus.com. I'm somewhat of a specialist; I tend to handle things that require an in-depth knowledge of auto racing or flying. I've been doing it for a few years now and as a result I have amassed a respectable collection of games, simulators, and controllers such as steering wheels, flight controls, and other associated peripherals. Far and away the best stuff I've ever gotten to play with comes from a company called Thrustmaster. Their equipment is not the most expensive available, but they are pretty much the market leader at the top of the "mostly affordable" demographic, by which I mean you have to be pretty dedicated to spring $600 for one of their top-end steering wheels, but not rich. Too rich for me, of course, given the other very expensive hobbies I have, but that's why I value the reviewing gig so highly. When I reviewed the Thrustmaster T500R racing wheel last November, I had only very minor quibbles with its design. As I recall, I found the overall unit to be precise, powerful, and plenty of fun, with just a few irritating issues. The first was, not surprisingly, the cost of the unit. In the neighborhood of $600, this is a steering wheel that calls for a bit of pecuniary dedication on the part of the purchaser, to say the least. For that princely price, you get a high quality, well designed product that at the end of the day might leave you wishing that a couple of things had been done differently, depending on your taste in racing genres. Specifically, I had two complaints: the shifter paddles were mounted to the wheel rather than the base, which made shifting gears while turning the wheel an exercise in hand gymnastics, and the wheel itself was too large for the open wheel cars that I prefer to race. 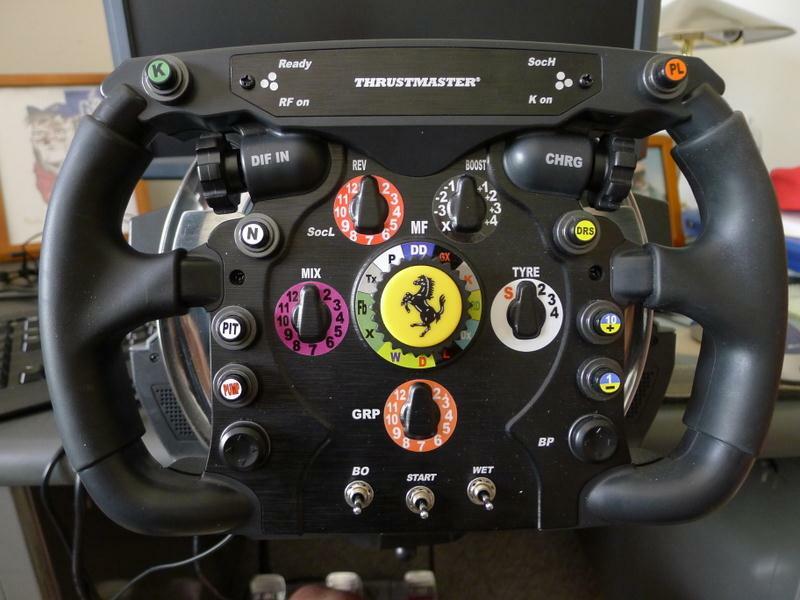 I obviously hadn’t tripped across an issue that had somehow escaped the marketing folks at Thrustmaster, though, because soon thereafter I learned that a replacement wheel was available as an add-on, and that this wheel is modeled after the steering wheel in the Ferrari Formula 1 car. Thrustmaster had addressed both of my complaints, albeit with the requirement of another $200 expenditure, a tough nut to swallow after the initial $600. And here again, Thrustmaster is way out in front of me. Just a couple of weeks ago, they asked if I would be willing to take a look at what they call the Ferrari F1 Wheel Integral T500. In easier to understand terms, this is the T500 with the F1 wheel instead of the bus driver’s wheel that comes with the T500R. The wheels are actually interchangeable via a transplant operation that only takes a couple of minutes to accomplish, but being able to buy the wheel type that you want rather than having to buy both if you happen to be an open-wheel fanatic is a much better solution. Naturally I agreed to their proposition. As with almost everything they have sent for review, I scored it at an A-. The minus comes from 1) the cost, and 2) nothing is perfect, but they come mighty close. Fast forward to a couple of weeks ago when I received an email from the editor of the game review site. Thrustmaster has a new product coming out that they're very excited about, and they wanted to know if GamingNexus would be interested in being one of only 15 press outlets invited to the press release event in San Francisco. This being my specialty, I was offered first rights of refusal for the trip. Despite my aversion to travel, I readily accepted. It was a pretty easy decision: they were footing the cost of airfare and hotel. I departed westward early Thursday morning for my ten hour trip (four hour layover in Phoenix) to California. I arrived at San Francisco International (SFO) with plenty of time to spare, so rather than spend $50+ on a taxi, I elected to try my hand at public transportation, or BART in the San Fran vernacular. Public transportation, while cheap and readily available, can be somewhat difficult for the outsider to figure out. And I'm not just referring to getting on the right train and getting off at the correct stop, either. It can be difficult just to figure out how to buy the ticket! I was eventually able to get a ticket, and navigation to the hotel was a breeze. There is only only route that leaves SFO, and it just happens to stop at the Powell St. station. That was quite handy since the hotel provided by Thrustmaster was on Powell St. How hard to find could that be? Pretty hard, as it turns out. I popped up from the subway station and found myself immediately directionally flummoxed. Which of these is Powell Street? I pulled out my trusty cell phone with its built-in GPS and found out: none of them. I would have to walk down Market St. for half a block. Once you get near it, Powell St. is easy to identify: it has the legendary cable cars. A couple of blocks up the hill I found the hotel. It's not quite The Ritz, but it's still pretty ritzy! The new product that they will be releasing in a couple of weeks is interesting in that it is being co-branded with Ferrari, perhaps the most successful, well known, and dominant Formula 1 racing team in the history of the sport. Oh, and they make street cars too, but those steadfastly remain well outside of my budget. The press party was going to be held in the Ferrari store just a block and a half from the hotel. They refused my request for a test drive. Probably for the best - I don't want to ruin my love for my SLK. The event came complete with models (not of cars - real live female models) and a celebrity guest: Mr. Oriol Servia. If you watch that video, at the :55 mark you can see a very difficult part of the track. It's a right hand turn just after the crest of a hill. I have struggled with that turn for a long, long time. What happens is that the car gets light at the crest of the hill and as I enter the right turn after the crest, I routinely spin out. Now this is a testament to the accuracy of the iRacing program: I was telling Oriol about my problem with that turn, and just as I was telling him that I had finally solved the riddle of it, we ended up saying at exactly the same moment, "The secret is to enter it very early." It was a fascinating half hour, to say the least. Thrustmaster had also brought in a $36,000 full motion platform and had iRacing set up to run. Unfortunately, they had selected a track (Mosport, in Canada) as the track we would be able to drive on. The reason that it was an unfortunate selection is that I have never run a single lap there. I would be starting from scratch. In a very high-powered F1 car. What could go wrong? Well, I'll tell you: I could be doing it in front of a professional racing driver and a very cute model. The shaded glasses have nothing to do with my future racing prospects being so bright that I need to wear shades. Rather, those are 3D glasses. I have to say the 3D offered more assistance to racing than the motion platform did. Having depth perception on the track makes a tremendous difference. This led to another conversation with Oriol about the use of brake markers (small track side landmarks that drivers use to measure their braking points). He confirmed my theory that the breaking points are actually more as reminders that braking is going to be required than they do has hard and fast "brake here" markers, the reason being that the handling of the car changes for various reasons as the race progresses. Do you see how intently Oriol is watching me drive? In retrospect I now think he was sizing up the competition. Yes, the competition. After a phenomenal dinner that started with appetizers (jumbo shrimp wrapped in prosciutto and grilled, polenta cakes with guyere cheese, and something I was afraid to try) and followed with four Italian dishes (gnocci in marinara sauce, scallops, pasta primavera, and veal scallopini) catered in by the same chef that caters to the Italian Consulate, the event planners had scheduled a head-to-head race between Oriol and his choice of press victim. It would be a race using the F1 2011 game for the Xbox that I had actually reviewed a few months ago. I got to pick the track and difficulty level. I picked Spa-Francorchamps in Belgium, one of the oldest and best known tracks in the world. As famous as the track itself is, it pales in comparison to the legend of just one of its turns: Eau Rouge. The 2005 and 2006 F1 World Champion Fernando Alonso (ed: who currently races for the Ferrari team) explains: "You come into the corner downhill, have a sudden change [of direction] at the bottom and then go very steep uphill. From the cockpit, you cannot see the exit and as you come over the crest, you don't know where you will land. It is a crucial corner for the timed lap, and also in the race, because you have a long uphill straight afterwards where you can lose a lot of time if you make a mistake. But it is also an important corner for the driver's feeling. It makes a special impression every lap, because you also have a compression in your body as you go through the bottom of the corner. It is very strange - but good fun as well." Here's a lap of Spa in the iRacing F1 car. Eau Rouge is at the 15 second mark. Turn ten is at the :40 second mark. I figured Oriol would be very familiar with Spa, so I would gain no advantage with the track selection, but I thought maybe I could get the upper hand by turning off all of the 'assists' in the game. An Xbox game drives nothing like iRacing, and it is even further away from driving like a real car. Having had quite a bit of experience with it myself, I figured I could build up a pretty decent lead before he could come to grips (heh!) with it. Here we are at the start, waiting for the green flag. As I had predicted, Oriol had quite a bit of trouble on the first few laps. He spun out three times on the first lap alone, but managed to keep from damaging his car. My hopes for an easy win from him knocking a wing off of his car were dashed, but I still built up a 14 second lead. All I had to do was keep from wrecking myself and I'd have the win! Or so I thought. Compare our looks: I'm out for a Sunday drive, while Oriol, who had no desire to be upstaged by an IT geek, has his game face on. I was still in the lead on the sixth (of nine) lap, but I started seeing notifications that he was going purple (setting the fastest lap time) each lap. I was doing 1:55 laps when I saw him go to 1:53, 1:52, and finally, 1:50. I stepped up my game, but could only do 1:53. It was clear that he was going to catch me. I tried to distract him: "Hey, how does that push-to-pass button work in the Dellara? Does it just override the rev limiter, or does it do something like closing the turbo waste gate to create more boost?" His answer: "It makes the car go a little faster." Clearly, he was not going to let me distract him. Damn. Now what? Well, nothing. He was right on my tail early in the 7th lap. All I could do was try to keep tight into the apexes of the turns and leave him no room to pass. That all fell apart in turn 10, a downhill, reverse camber, 180 degree turn) when I went wide and drifted into the gravel. I was done - there would be no catching him. Except... he slowed down on the track to let me take the lead again. He said, "That was too easy. I want to really pass you." "Hey, are you going flat through Eau Rouge?" I asked. "Really?? I am!" I lied. "Okay, this time I will go flat." I hid my grin: I had him now! There was no way he was going through that turn flat out and coming out the other side still in the lead. Yeah, well, you see this coming, right? He did it! Now, you may think this was just play for him and that surely he couldn't be considering this a real race. I'm not so sure - is this the reaction of someone winning a meaningless race?